This is a fantastic project for someone who is new to sewing. This would also be a perfect project for teaching kids how to sew. So let's get started! Cut your cotton woven fabric into 2 rectangles 13 inches by 15 inches. Cut 2 strips of tulle 4 inches tall by 44 inches wide. Cut 2 pieces of webbing, each 15 inches long. If you want longer handles, cut your pieces longer. Exciting things are in store in the coming year for Sew Happily Ever After. Subscribe now so you don't miss a thing! Take your 2 rectangle pieces and place them right sides together. The short side of the rectangle should be at the top and bottom, while the long edges will be on the side. Sew along each edge using a 1/2 inch seam allowance. You can sew right off the edge of the fabric for each seam if you don't want to put your needle down and pivot. I find that for a beginning sewer, it's just as easy to sew right off the edge of the fabric and turn the fabric to sew the next seam. Since this bag will not have a lining, you will definitely want to finish the seam allowances. Change your machine to a zig-zag stitch and sew with this stitch right next to the seam you just made. Don't let the zig-zags cross the seam. I used a 3-step zig-zag, but you can also use a regular zig-zag. This will prevent your bag from coming unraveled and falling apart. Trim the excess fabric away from the line of stitching that you just made. Trim carefully and don't snip any of your stitches. Press these seams to set them. Turn you bag right side out. Now we will attach the handles. Take one piece of your webbing and measure in from the left side 3 inches. Pin or clip one side of the webbing in place. Attach the other end of the webbing 3 inches from the right hand side. Don't let the webbing twist while pinning it in place. Repeat for the second handle on the other side of the bag. Baste the edges of the handles in place close to the raw top edge of the bag. Repeat for the second handle on the other side of the bag. Now we will gather the tulle to add to the top of the bag. Place your pieces of tulle right sides together and sew the 2 short edges with a straight stitch using a 1/2 inch seam allowance. Use a long basting stitch on your machine to gather the long edges of the tulle. The long basting stitch allows you to gather the tulle easily. And since tulle is thin, it generally gathers some while you are stitching. Gently pull on the either the top thread or the bobbin thread to help it gather, but don't pull on both threads at the same time. Gather the tulle until it is about the same width as the top of the bag. Use clips or pins to hold the tulle in place right sides together. Spread the gathers evenly along the top of the bag, lining up the raw top edges of the bag with the raw edges of the tulle. Sew the tulle in place with a regular straight stitch using a 1/2 inch seam allowance. Finish the seam allowance as we did when we sewed the sides of the bag together. Trim the excess fabric being careful not to trim away the zig-zag stitching. Fold the tulle and handles up and away from the bag, pressing the seam allowances down. Use a low setting on the iron so you don't melt the tulle. Take your ribbon and line the top edge of the ribbon with the fold that you just pressed. This will cover your seam allowance and make the top of your bag a bit more sturdy. Sew a line of stitching along the top edge of the ribbon. Continue sewing the ribbon until it overlaps at the beginning by a 1/2 inch. 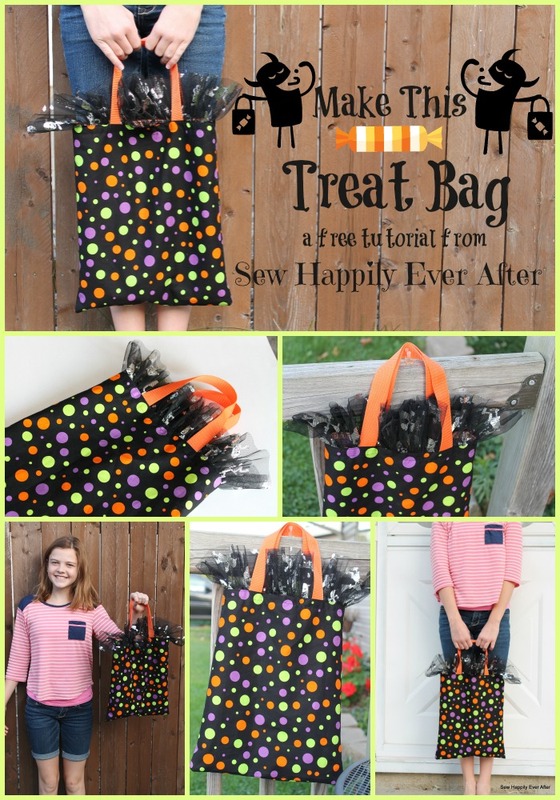 This is the trickiest part of the bag because you need to make sure that the tulle and handles stay facing up and separate from the bottom of the bag. Pinning the ribbon in place before sewing will help you to keep it lined up and straight. After you have sewn around the top edge of the ribbon, sew around the bottom edge of the ribbon. This will make a nice, clean finish for the top of your bag. And your bag is finished! Proudly use it and show it off.